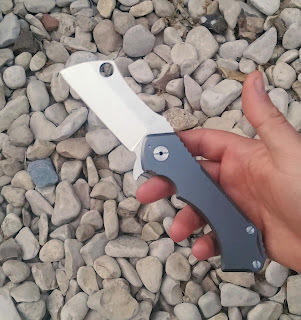 I ordered this knife in the recent AliExpress sale and it finally arrived to me for a review. This version of Cleaver comes in a different case (black cardboard one vs the plastic case the previous, more premium version came in). Overall the knife has the same dimensions (3.5" blade) and weight (the budget version is ~5g lighter at 222g). The biggest difference between the versions is the finish on the handle - a grey coating on the budget vs sandblasting on the premium. The budget also has horizontal stripes on the frame side and some small scratches on the handle. The blade has 2 tone finish (stonewashed flats and satin grind), all the edges are smooth and the blade is sharp. Lockup is excellent (has a steel insert) and the blade is centered. The knife came very oiled from the factory, not the best kind of oil (the thick yellow one), so it needed to be opened up and cleaned. After I opened it up and cleaned it, I noticed it has double row bearings (on mine one was steel, the other ceramic, have steel washers to separate them from the handles). I checked all the parts with a magnet and can confirm they are in fact made from titanium (scales, backspacer and pocket clip). After the cleanup and application of lube the knife became significantly smoother. In summary - the difference between the versions is primarily in the quality of the finish. I think both versions were done using the same blueprints. If you just want to feel the design, the budget version might fit you. But if you need more in terms of quality - get the premium, as it is done a bit better IMO and is more similar to the genuine RAD knife. I just received this knife myself and love it so far. After opening it up and cleaning it, what did you use to lube it with again?